Covert saccades in patient with complete vestibular loss on R. Now most of the saccades occur within the head thrust. Same patient, 1 year earlier. More "overt" saccades -- defined as those around 200 ms and later. "Overt" saccades are defined as corrective eye movements made after the head comes (substantially) to rest. This is sometimes a little hard to pin down, and to be precise, we will say when head velocity goes through 0 deg/sec. "Covert" saccades are made earlier than head velocity returning to 0, usually during the high velocity part of the head movement. As covert saccades are made prior to the head coming to rest there must be some predictive aspect to them. Overt saccades are mainly made after the head is fairly still and visual feedback is available. Covert saccades are difficult to see by an examiner, but can be easily measured with the more rapid response camera technology used in the VHIT test. Covert saccades are desirable because one can see quicker after a head movement. Occasionally overt saccades go in the wrong direction. We have not seen these, but Heuberger et al (2014) stated that they occur "commonly", and in fact in 38% of patients. We ourselves think that this is still rare and we are puzzled why these authors found 38% when we find <1%. We have noted that technique is important -- if the patient is not looking at the target, the direction of their saccades can be pretty erratic. The ability to detect "covert" saccades, as illustrated above, is what makes the VHIT device better than just doing the HIT test by hand. That being said, it is pretty difficult to fool an experienced examiner doing a HIT test, as at the beginning of the HIT test, the patient has little experience and has problems making predictions. We have observed patients with "covert" saccades as early as 1 week post vestibular neuritis, while on large amounts of meclizine. We have also observed "overt" saccades in patients more than 1 year "out" from unilateral loss. Thus, it would seem that there is a lot to learn about the supposed ability of covert/overt saccades to detect compensation. Measures of covert saccades include their amplitude, timing, and pattern -- i.e. are some too big, requiring backup saccades. Is there a series of covert saccades, or just one. Problems with study of covert saccades. There are quite a few caveats regarding covert saccades. While naive theory would suggest that covert saccades are predictive, and overt are sensory, things are really not that simple. Presumably there is some blending together of sensory input and prediction in as much as the time that these saccades are made is not "set in stone". The definition of the end of head movement can be a little fuzzy as often there is a "backlash" after the head velocity goes through zero. As reactive saccades (not involving head movement) take about 100-200 msec, and vision is often not really stable because of the backlash, one would expect that an "overt" saccade, that is visually triggered, would have to occur more than 100 msec after head velocity is zero. Finally, as can be seen on the left, covert saccades are not all made at the same time. In persons with unilateral vestibular loss, covert saccades might in theory be triggered by sensory input from the remaining side. However, it is unlikely that much sensory information is available in as much as the VOR gain is so low. Still,one would expect that persons with unilateral loss would be more accurate than persons with no vestibular function at all (e.g. bilaterals). 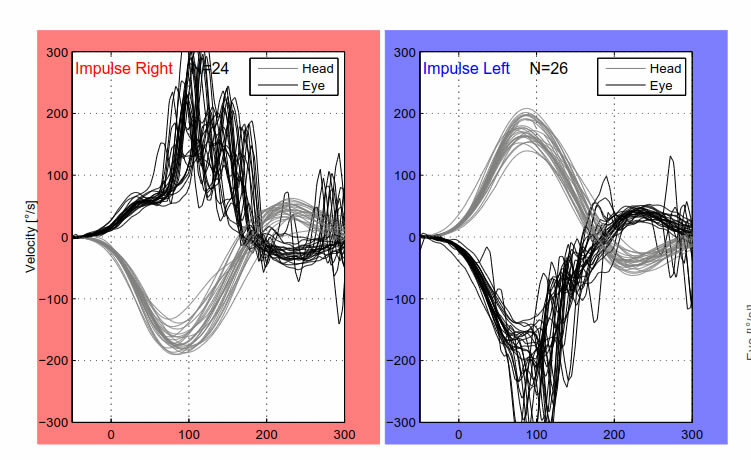 Other sources of covert triggers might be intention (if the head movement is being generated by the subject), previous experience (if the head impulse is predictable -- see below) , cervical input, and visual input during the impulse. Van Nechel et al (2019) pointed out that saccades in bilateral loss patients are highly contingent on viewing conditions. In dark, there are roughly 50% less saccades ! So in other words, corrective saccades are not really automatic as they depend on intent or vision or both. Heuberger, M., et al. (2014). 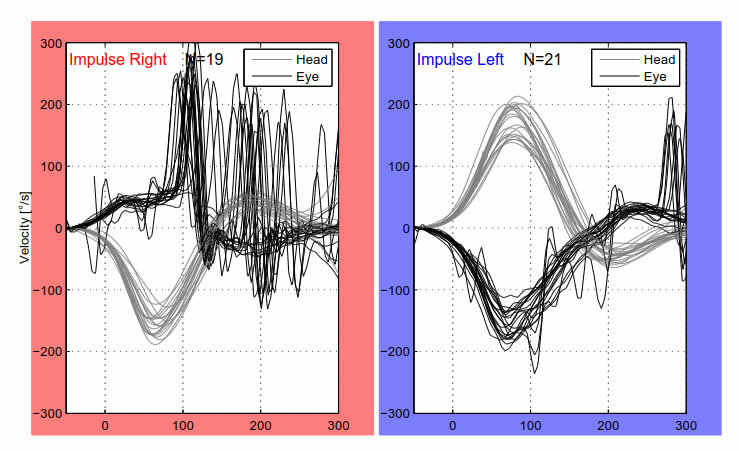 "Covert anti-compensatory quick eye movements during head impulses." PLoS One 9(4): e93086. Tian, J., B. T. Crane, et al. (2000). "Vestibular catch-up saccades in labyrinthine deficiency." Exp Brain Res 131(4): 448-57. Tjernstrom, F., et al. (2012). "How to uncover the covert saccade during the head impulse test." Otol Neurotol 33(9): 1583-1585. Van Nechel, C., et al. (2019). "Visual input is the main trigger and parametric determinant for catch-up saccades during video head impulse test in bilateral vestibular loss." Frontiers in Neurology 9. Weber, K. P., S. T. Aw, et al. (2008). "Head impulse test in unilateral vestibular loss: vestibulo-ocular reflex and catch-up saccades." Neurology 70(6): 454-63.